Anxiety is a persistent feeling of dread, impending disaster, tension, apprehension, and persistent worry about every day situations. Anxious people are primarily preoccupied with apprehension about the “future.” They dwell on the “What ifs.” “What if ‘x’ happens? What will I do?” Anxiety and panic disorders involve a group of disorders that include stress, discomfort, anxiety, fear of losing control, catastrophizing, negative thoughts, obsessions, insecurity, low self-esteem, and lack of confidence. Physical symptoms include: trembling, sweating, cold or clammy hands, abdominal distress, dry mouth, facial flushing, muscle weakness or tightness, impending doom, numbness, and heart palpitations. The mental and physical symptoms often cause impairment in work and social relationships. Anxiety is often associated with fight-or-flight biochemistry, which includes epinephrine, norepinephrine, and cortisol. These hormones and neurotransmitters are associated with both anxiety and stress. Stress has a lot to do with how we respond to external stimuli while anxiety is usually about how we respond to internal stimuli. Many people feel anxious when anticipating a particular event, place, or person. Chronic anxiety is usually not a response to a specific external trigger or stressor, and it may last for months or years. Anxiety, which has become the number 1 mental health issue in America, affects 18% of the American population or about 40 million people. Close to 48 million prescriptions were written in 2011 for the anti-anxiety drug Xanax. About one-third of us suffer with anxiety but not all of us seek help for it. Low Serotonin (whose precursor is the amino acid, L-tryptophan) can cause anxiety. Low GABA (gamma amino butyric acid), whose main precursor is the amino acid L-glutamine. GABA (an inhibitory neurotransmitter) is our natural “valium.” Low GABA causes anxiety. GABA can be supplemented directly. Low Dopamine (whose precursors are the amino acids L-tyrosine and L-phenylalanine) can cause anxiety. Elevated Norepinephrine and Epinephrine are associated with anxiety and panic disorders. However, the role of norepinephrine in anxiety is not yet settled. Three other amino acids lower anxiety — taurine, glycine, and l-theanine. 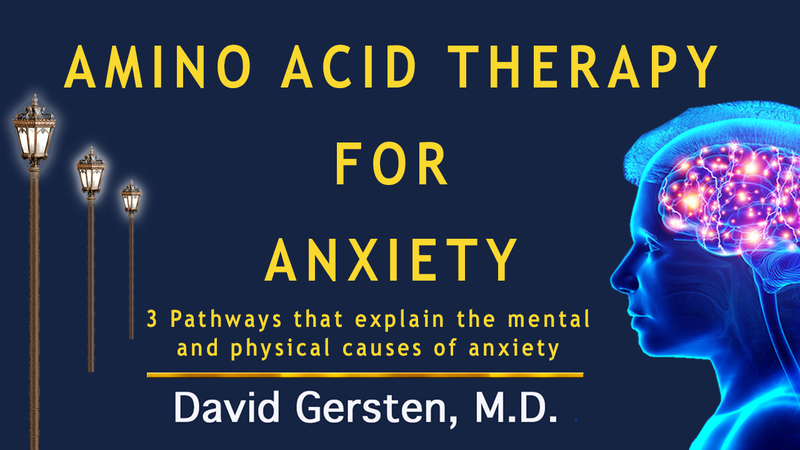 We have some good ideas about the biochemistry of anxiety, and we have a number of different kinds of anxiety, which include: generalized anxiety disorder (GAD), panic disorder, phobic disorders, such as agoraphobia and social phobia, obsessive-compulsive disorder (OCD), post-traumatic stress disorder (PTSD), and separation anxiety disorder. Agoraphobia has 2 main phases: 1) devastating, acute panic attacks, and 2) anticipatory anxiety (the anxiety people experience anticipating when the next panic attack is going to occur). When a person has their first panic attack, they often have a feeling of impending doom and think they’re having a heart attack. They go to the emergency room and are told they’re fine. They may return to the ER several times before a doctor realizes that the problem is an anxiety disorder. To illustrate this, let’s say someone hit you over the head with a non-lethal hammer. A month later it happened again. Then you had 3 attacks in the next week…followed by 3 months without an attack. These “attacks” are panic attacks, and their frequency is unpredictable. If you knew they were coming once a week, you could be better prepared, but the fact that you can’t predict when they’ll occur is what causes anticipatory anxiety. The panic attack and anticipatory anxiety generally are based on different mental and physical states and require 2 different kinds of treatment. If the treatment is medication, agoraphobia will require 2 different drugs. A benzodiazepine or GABA treats the anticipatory anxiety phase of panic (agoraphobia). “Concern, worry, fear, and anxiety.” Each emotional sustain in this list is more intense and extreme than the one before it. These 4 emotional states are caused, in part, by ratios of one neurotransmitter to another. Over the last 25 years psychiatry has moved into a medical model of mental illness that focuses almost entirely on neurotransmitters, ignoring mental/emotional/social/spiritual issues and triggers. Let me illustrate with a businessman (Jim) whom I treated for panic attacks. It took several visits before the whole picture became clear to me, although I started him on medications during the first visit. His problems started during a challenging divorce. Jim’s wife had moved to Colorado and he had to fly to Colorado numerous times for court hearings. One time after another the judge granted his then-wife’s request for an extension. Jim wanted out badly, so he made an offer that no one could refuse. He offered to give his wife the house and all of his money and other assets. She refused, and the judge granted her another 6-month extension. Why would anyone be willing to give away virtually everything? He knew that he was a good businessman and that he had a lot of contacts. He was confident that he could rebuild his career and start over. He came in for an appointment looking very relaxed and said, “It’s over. My wife didn’t even show up for the hearing. The judge wasn’t happy, and he reviewed all the paperwork carefully, then looked at me and granted the divorce. It’s over.” He was a happy man who was no longer anxious. He was no longer feeling trapped and out of control. There are times when anxiety is a normal response to a particular situation. Here’s a simpler example. You’ve got a really difficult boss. Nothing you do is good enough. He’s angry, rude, disrespectful, and is not open to communication. How do you feel? Like strangling him? You risk being fired and you need the job, so you bury your hurt and anger, feeling trapped…and anxious. For now, you might be feeling stuck in a cage. You haven’t yet figured out how to leave…or learn to adapt. What causes anxiety? It’s a combination of biochemistry (neurotransmitters, bioelectrical activity, and hormones), psychological predisposition, and social factors. To reduce anxiety to biology is a major disservice and it actually deprives a person of the motivation to learn stress reduction, to exercise, meditate, and watch their diet. Deficient serotonin is associated with anxiety, obsessions, and compulsions, which is why SSRI antidepressants, like Paxil (which raise serotonin levels in the short term), are a psychiatrist’s first-line treatment for anxiety. Sadly, Paxil has triggered many severe cases of anxiety while dramatically decreasing libido .The natural way to increase serotonin is by taking L-tryptophan, which enters the brain, gets converted into 5-HTP, which then gets converted into serotonin. Some people’s anxiety responds best to 5-HTP and others to L-tryptophan. In order for L-tryptophan to get converted to serotonin, the active form of Vitamin B6 (pyridoxal-5-phosphate) is required. Catecholamines (Dopamine, Norepinephrine and Epinephrine), The fight-or-flight neurotransmitters and hormones. Deficient dopamine is associated with social anxiety and panic disorder. Increasing dopamine (through the amino acid L-tyrosine) will help alleviate certain kinds of anxiety. But there is a caveat. When dopamine gets too high, a person starts to worry a lot. As dopamine gets even higher, worry turns into “fear for no reason.” Extremely high dopamine can cause paranoia. Most anxiety is associated with elevated norepinephrine. Our fight-or-flight biochemistry (dopamine, norepinephrine, epinephrine, and cortisol) prepares us for battle or to run, and it makes our heart pound and race. There are many people who are anxious and depressed, whose problems are caused by the same neurotransmitter, usually norepinephrine or dopamine. In this case, correcting one neurotransmitter imbalance will improve both anxiety and depression. Psychiatry often refers to “chemical imbalances” but most psychiatrists don’t believe they have a way to test for those imbalances. It’s not difficult to test for neurotransmitters, as you’ll see throughout this web site. What has become more and more clear is that neurotransmitter “ratios” are important. For example, anxiety is associated with “high norepinephrine/low serotonin.” Balance among neurotransmitters is important. Anxiety can also be associated with “low dopamine/low serotonin.” All the neurotransmitters involved in anxiety are amino acids. Amino acid therapy for anxiety makes sense and has been used for decades. Vitamins and minerals serve as the co-factors for amino acid chemistry. B vitamins (and Vitamin C) are our stress vitamins. In terms of neurotransmitters involved in anxiety, we need vitamins B1, B3, and B6 (active B6). Deficient zinc, combined with elevated copper levels is associated with anxiety. It’s the “ratio” that’s important. Copper should be 70% of zinc. Anxiety is caused by mental/emotional, social, and biological factors. PTSD is considered an anxiety disorder but the mechanism is “dissociation” so the psychotherapist has to understand abuse and trauma. If s/he doesn’t understand trauma, the therapist can trigger PTSD, rather than alleviate it. There are few comprehensive theories about anxiety, but there is one that is helpful. Anxiety leads to shallow breathing. Shallow breathing leads to low oxygen perfusion in the blood, which leads to muscle tension and cramping. This tightening and cramping of muscles leads to a build-up and release of lactic acid. Lactic acid travels to the brain where it causes anxiety. This is one vicious cycle, which can be interrupted at each step. Hypoglycemia can cause anxiety. The mechanism may be that falling blood sugar levels trigger a release of adrenalin (epinephrine). Adrenalin then triggers heart palpitations, anxiety, and panic. Reactive hypoglycemia occurs after a high-carbohydrate meal, which causes a large release of insulin. Insulin drives blood glucose out of the blood and into the cells, resulting in an overall drop in blood sugar levels. Anxiety does not cause hypoglycemia, but hypoglycemia can cause anxiety. Eating frequent, small meals (and avoiding high carb meals) is a way to start getting a handle on hypoglycemia. 1. Look at everything in a patient’s life. 2. Look at the biochemistry of neurotransmitters, amino acids, vitamins, minerals, essential fatty acids, inflammation, stress, and hypoglycemia. 3. Look for signs of neglect, abuse, and trauma. Look to see if the freeze response and dissociation are present. 4. Look for and treat hypoglycemia. 5. After many pieces of this puzzle are brought to light, get specific. Zero in on key physical treatments. Zero in on mental fitness techniques that reduce stress and anxiety. Teach stress reduction and meditation. Reduce stimulants in the diet, like large amounts of caffeine. Provide specific tools that your patient can begin practicing at home. Start slow, practice a little bit every day. Over time, little steps turn into very large leaps of progress. 6. Use benzodiazepines for short-term, emergency relief of anxiety. Their effectiveness starts to drop fairly quickly and a person becomes dependent on them. After awhile they stop working, and getting off these medications is often difficult and must be done very slowly. 7. Use natural treatments whenever possible. Drugs may provide relief on a short-term, emergency basis, but they cause long-term problems. 1. We tend to focus on the software, the neurotransmitters in anxiety and depression. The physical brain is the hardware of mental activity. There is research showing which parts of the brain, the hardware, “light up” during stressful situations and anxiety. 2. The hormone oxytoxin, called “the love hormone,” is involved in attachment. When anxiety is associated with attachment and abandonment issues, oxytoxin may prove to be a very effective treatment. 3. PTSD is the most complex of anxiety conditions, and in truth it is more than a problem with anxiety. It involves dissociation (disconnection), the freeze response, and a wide variety of emotions experienced in a day. Whatever we think about on a regular and frequent basis creates neural pathways that grow “deeper” and stronger over time. The more you think about something the more it becomes part of who you are. Anxious people think about things that produce anxiety. That “wiring” can be changed. Research regarding PTSD is showing some very interesting things. It’s not the actual trauma that gets deeply encoded into our limbic system, the primitive reptilian brain. It’s the environment in and around that trauma that gets deeply encoded in the amygdala and hippocampus. This “environmental encoding” explains why the sounds, sights, and smells that were in the environment at the time of a trauma can trigger panic and flashbacks of the traumatic event.